I have had the pleasure of watching the ESPY golf swing program grow from theory to work in progress to full blown teaching tool. Very good at explaining the swing as it relates to the muscles used in the swing. And how those muscles are used to generate club head speed. Charles went to great detail of relating the golf swing to the baseball swing to help the golfer establish the mechanics of the body. I would recommend the program to golfers looking for a logical way to make their swing more efficient and consistent. One of the best means to perform a golf swing analysis is to capture the golf swing in slow motion, with either time-lapse photography or video. With the availability of I-phones and golf apps, this can be readily performed, with the assistance of a friend on the course. I was able to analyze hours of golf swing videos of myself and professional golfers to develop a very simple golf swing. I used my background in procedure writing for energized transmission hi-line work to develop the perfect golf swing fundamentals in The ESPY Golf Swing Coach. I even found that energized transmission hi-line work can be simplified with proper mechanics, according to a sequence. The same approach can be applied to the golf swing as well. The golf swing mechanics and proper sequence can be applied to your golf swing to maximize distance and control. One of the most historical golf swing analysis performed was when Mr. Arnold Palmer and President Eisenhower teamed up to play in the 1964 benefit for the American Heart Association in Merion, Pennsylvania. Mr. Palmer noticed on the practice range that the President’s right elbow was flaring outward in the backswing. After Mr. Palmer brought this to the President’s attention, President Eisenhower did such a great job of keeping his elbow next to his right side that he wore a blister on his elbow. What Mr. Palmer was trying to get President Eisenhower to do was to Synch his right elbow with his shoulders. Synching the elbow with the shoulders was the main priority that I focused on while working on The ESPY Golf Swing Coach, in Madison, MS. 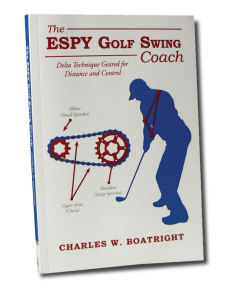 This book, The ESPY GOLF Swing Coach, was written to allow golfers to use mental images to develop muscle memory, instead of swing thoughts. Muscle memory produces a confident golf shot, even under competition. This book is ideal for the beginner golfer as well as the lower handicap golfer. Most golfers seek to get better by making their golf swing consistent and as simple as possible to produce distance and control. The ESPY technique is like riding a bicycle: once you learn, you don’t forget. Overcome common obstacles to develop a consistent golf swing. Most golfers have played baseball during their youth, The ESPY Golf Swing Coach allows the golfer to take the baseball swing from the batter’s box and apply it to the tee box. Why not take advantage of a swing that you are comfortable with and apply it to your golf swing. I HAVE, and you CAN. Gear up your golf game with The ESPY Golf Swing Coach.